TC Ranch of Franklin, Nebraska strives to put together a package of sound, balanced genetic traits in their registered Angus cattle. This operation was built from the ground up by Vance and Connie Uden and their son, Dru. The ranch continues to be family owned and operated by Connie and her son, Dru. As 4-Hers and Junior Angus members, Vance and Connie met showing their Angus cattle. Vance majored in animal science at the University of Nebraska and was active on the livestock judging team. And yes we are BIG RED fans. 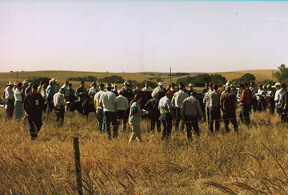 TC Ranch is located in south central Nebraska in the Republican Valley. The 8,000 acres ranch consists of 2,000 acres of crop and hay land with the balance in upland pasture. Irrigated corn, alfalfa, soybeans, and native and cane hay grasses are raised. 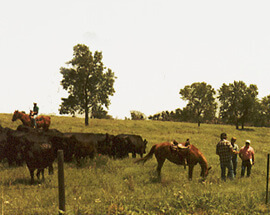 The herd consists of 700 registered Angus cows plus 100 to 150 yearling heifers. During the first week of November the cows are turned into the corn stalks for winter. In late January the heifers start calving on the winter pasture and the cows follow suit in February. Around April 1, we move the cows into what we call our AI pastures - which are mostly native grass. The majority of the herd is Spring calving but we also have a small Fall breeding program. Around the first of June we move the cows to raise their calves on the breaks of the Republican Valley for the summer. This management is typical of the commercial cattle industry in our area. The grass is a mixture of big and little bluestem, buffalograss and native grasses. We have used rotation grazing during the last 20 years. It meant a lot of cross fencing, but it has been worth it. In our area over 50 percent of the calves are background and many are retained ownership in the feedlots. We steer and then feed approximately 35 percent of our bull calf crop. This assures a quality bull crop to our customers and also gives us carcass data on our herd sires. TC Ranch is our life—and the friendship of our Angus friends is the foundation of our progress.